Purpose: To evaluate whether 6.6-mm long implants could be a suitable alternative to longer implants placed in vertically augmented atrophic posterior mandibles. Materials and methods: Sixty partially edentulous patients having 7 to 8 mm of residual crestal height and at least 5.5-mm thickness measured on computed tomography scans above the mandibular canal were randomly allocated according to a parallel-group design either to receive one to three submerged 6.6-mm long implants or 9.6-mm or longer implants (30 patients per group) placed in vertically augmented bone. Bone was augmented with interpositional anorganic bovine bone blocks fixed with titanium plates and covered with resorbable barriers. Grafts were left to heal for 5 months before implant placement. Four months after implant placement, provisional acrylic prostheses were delivered, replaced, after 4 months, by definitive metal-ceramic prostheses. Outcome measures were: prosthesis and implant failures, complications, and radiographic peri-implant marginal bone level changes. Patients were followed up to 8 years after loading. Results: Eight years after loading 12 patients dropped out, five from the short implant group and seven from the augmented group. The augmentation procedure failed in two patients and only 6.6-mm long implants could be inserted. There were no statistically significant differences for prosthesis and implant failures. Four prostheses failed in three patients of the short implant group versus three prostheses in three patients of the augmented group (Fisher exact test P = 1.000; difference in proportions = 0.01; 95% CI: −0.19 to 0.22). Five short implants failed in three patients versus three long implants in three patients (Fisher exact test P = 1.000; difference in proportions = 0.01; 95% CI: −0.19 to 0.22). There were statistically more complications in augmented patients (27 complications in 22 augmented patients versus 9 complications in 8 patients of the short implant group) (Fisher exact test P < 0.001; difference in proportions = 0.64; 95% CI: 0.38 to 0.79). Both groups gradually lost peri-implant bone in a statistically significant way. Eight years after loading, short implant group patients lost an average of 1.58 mm of peri-implant bone compared with 2.46 mm in the augmented group. Short implants experienced statistically significantly less bone loss (0.88 mm, 95% CI: 0.50 to 1.26 mm) than long implants. Conclusions: When residual bone height over the mandibular canal is between 7 and 8 mm, 6.6-mm short implants are an interesting alternative to vertical augmentation in posterior atrophic mandibles since the treatment is faster, cheaper and associated with less morbidity. Biomet 3i manufactured the implants used in this investigation and partially supported this trial up to the 5-year follow-up; however, data belonged to the authors and Biomet 3i was not involved in the conduct of the trial or the publication of the results. After that date Biomet 3i was acquired by Zimmer Dental, and sponsorship of the study was discontinued. Purpose: To compare the clinical outcome (in particular of marginal peri-implant bone level changes) between immediately loaded straight implants which had definitive abutments placed at implant placement and never removed versus implants which had no intermediate abutments. Materials and methods: Thirty-two edentulous patients had one of their jaws rehabilitated with a provisional screw-retained resin reinforced cross-arch fixed prosthesis supported by four immediately loaded implants: two central straight implants and two either tilted or straight distal implants. The two central straight implants were randomly allocated in two equal groups to receive or not an intermediate abutment (Multi-Unit Abutment, MUA) according to a parallel group design. To be immediately loaded implants had to be inserted with a minimum torque of 30 Ncm, which was achieved by all implants. After 4 months, definitive screw-retained metal-ceramic prostheses were delivered and patients were followed-up to 5 years after loading. Prostheses were removed every 8 months to facilitate professionally delivered maintenance. Outcome measures were prosthesis and implant failures, complications, peri-implant marginal bone level changes and bleeding on probing (BoP). Results: Five-years after loading one patient dropped out from each group. No implant or prosthetic failure occurred. Three patients of the abutment group versus one of the no-abutment group were affected by complications (risk difference = 0.125; 95% CI: −0.13 to 0.37; Fisher exact test, P = 0.600). At 5 years, both groups lost marginal bone in a statistically significant way (0.32 ± 0.40 mm for patients of the abutment group and 0.35 ± 0.29 mm for patients of the no-abutment group), with no difference in bone loss between groups at patient levels (difference = 0.03 mm; 95% CI: −0.23 to 0.29 mm; P = 0.809). At 5 years, BoP was significantly higher in the no-abutment group than in the abutment group (difference between medians = 25%; 95% CI: 12.5% to 25%; P < 0.001). By considering only the average of the two central study implants per patient with and without intermediate abutments, there were no differences in bone loss (difference: −0.05 mm; 95% CI: −0.41 to 0.31 mm; P = 0.763), while marginal bleeding was significantly higher in the no-abutment group (difference between medians = 25%; 95% CI: 0% to 50%; P = 0.004). Conclusions: The present results suggest that intermediate abutments may not be needed at immediately loaded cross-arch screw-retained prostheses, unless there is the necessity to correct implant angulation. This study was completely self-funded and the authors declare that they do not have any conflict of interest. Purpose: To compare outcomes of immediate non-occlusal loading with delayed implant loading in the bilateral replacement of mandibular first molars. Materials and methods: This study was designed as a split-mouth, randomised controlled trial. Twenty patients with bilaterally missing mandibular first molars randomly received immediately or conventionally loaded single implants. One molar was restored with a non-occlusal temporary crown within 24 hours after implant placement (immediate loading group, IL) while the contralateral molar was restored with a definitive crown 4 to 5 months later (delayed loading group, DL). A total of 40 implants were installed. All implants were inserted in healed bone with an insertion torque between 35 and 45 Ncm. Outcome measures were implant failure, complications, radiographic marginal bone level changes, probing pocket depths (PPDs) and bleeding on probing (BOP). Clinical data were collected at implant placement, and after 6, 12 and 60 months. Results: No patients dropped out and no implant failed. Only minor prosthetic complications were observed (two provisional acrylic crown fractures in the IL group and four ceramic chipping in the DL group). Two patients had bilateral peri-implant mucosal inflammation with BOP after 6 months. The differences between groups were not statistically significant (OR = 0.500; 95% CI: 0.045 to 3.489; P = 0.6831). At the 1-year follow-up examination, the mean marginal bone level was 0.83 ± 0.16 mm (95% CI: 0.75 to 0.91) in the IL group and 0.86 ± 0.16 mm (95% CI: 0.78 to 0.94) in the DL group, with no statistically significant differences between groups (difference = 0.03 ± 0.15 mm; 95% CI: −0.07 to 0.07; P = 0.53). After 5 years, mean marginal bone level was 1.06 ± 0.38 mm (95% CI: 0.97 to 1.15) in the IL group and 1.07 ± 0.32 mm (95% CI: 0.95 to 1.16) in the DL group, with no statistically significant differences between groups (difference = 0.01 ± 0.22 mm; 95% CI: −0.10 to 0.10; P = 0.96). The mean marginal bone loss after 5 years was 0.62 ± 0.45 mm in the IL group and 0.69 ± 0.33 mm in the DL group (difference = 0.07 ± 0.32 mm; 95% CI: −0.10 to 0.18; P = 0.567). At the 5-year follow-up the mean PPD and BOP values were 2.82 ± 0.65 mm and 1.17 ± 0.92 in the IL group, and 2.85 ± 0.53 mm and 1.17 ± 0.86 in the DL group, respectively. No significant differences were found (difference = 0.03 ± 0.15 mm; 95% CI: −0.15 to 0.21; P = 0.990; and 0.01 ± 0.07; 95% CI: −0.06 to 0.08; P = 1.000, respectively). Conclusions: Within the limitations of this study, the present data seem to confirm the hypothesis that the clinical outcome of immediate versus delayed loading of implants in mandibular fist molar sites is comparable. The authors deny any conflict of interest. This study was partially supported by Nobel Biocare. Grant: 2007 646. Purpose: To ascertain whether in the presence of a previously endodontically treated tooth with periapical pathology and/or symptoms and an uncertain prognosis, it is better to endodontically retreat it or to replace the tooth with a single-implant-supported crown. Materials and methods: Twenty patients requiring the treatment of a previously endodontically treated tooth, with periapical pathology and/or symptoms of endodontic origin and an uncertain prognosis, as judged by the recruiting investigator, were randomly allocated to endodontic retreatment (Endo group, 10 patients) or tooth extraction and replacement with an implant-supported crown (Implant group, 10 patients) according to a parallel-group design at a single centre. Patients were followed to 3 years after completion of the treatment. Outcome measures were: failure of the procedure, complications, marginal bone level changes at both teeth and implants, endodontic radiographic success (teeth only), number of patients' visits and days to complete the treatment, patients' chair time, costs, aesthetics assessed using the pink aesthetic score (PES) for the soft tissues and the white aesthetic score (WES) for the tooth/crown recorded by independent assessors. Results: No patient dropped out. One endodontically retreated tooth fractured and another had a crown loosening. There were no statistically significant differences for treatment failure or complications (difference in proportions = 0.10; 95% CI: -0.09 to 0.29; P (Fisher exact test) = 1.000). The mean marginal bone levels at endodontic retreatment/implant insertion were 2.10 ± 0.66 mm for the Endo group and 0.05 ± 0.15 mm for the Implant group. Three years after completion of the treatment, teeth lost on average 0.23 ± 0.82 mm and implants 0.62 ± 0.68 mm, the difference not being statistically significant (mean difference = -0.39 mm; 95% confidence interval [CI]: -1.12 to 0.33; P (t test) = 0.267). Three years after completion of the endodontic retreatment, of the four teeth that originally had a periapical radiolucency, one was lost, two showed complete healing, and one showed radiographic improvement. There were no statistically significant differences for the number of patients' visits (Endo = 6.67 ± 0.71; Implant = 6.10 ± 0.74; mean difference = 0.57; 95% CI: -0.14 to 1.27; P (t test) = 0.106). It took significantly more days to complete the implant rehabilitation (Endo = 61 ± 12.97; Implant = 191.40 ± 75.04; mean difference = -130.40; 95% CI: -184.45 to -76.35; P (t test) < 0.001) but less patients' chair time (Endo = 629.44 ± 43.62 min; Implant = 326 ± 196.99 min; mean difference = 303.44; 95% CI: 160.87 to 446.02; P (t test) = 0.001). Implant treatment was significantly more expensive (Endo = €1,588.89 ± 300.81; Implant = €2,095 ± 158.90; mean difference = €-506.11; 95% CI: -735.41 to -276.82; P (t test) < 0.001). Three years after treatment completion, mean PES were 11.11 ± 1.97 and 6.50 ± 2.46 and mean WES were 7.78 ± 1.30 and 6.80 ± 2.39 in the Endo group and Implant group, respectively. Soft tissues aesthetics (PES) were significantly better at endodontically retreated teeth (mean difference 4.61; 95% CI: 2.44 to 6.78; P (t test) < 0.001) whereas no significant differences were observed for tooth aesthetics (WES) (mean difference 0.98; 95% CI: -0.89 to 2.85; P (t test) = 0.281) between treatments. Conclusions: The present preliminary results suggest that both endodontic retreatment and replacement of previously endodontically treated teeth with persisting pathology and a dubious endodontic prognosis provided similar short-term success rates. Aesthetics of the soft tissues and time needed to complete treatment were in favour of endodontic retreatment whereas implant rehabilitation required half of the chair time than endodontic retreatment, but was significantly more expensive. Much larger patient populations and longer follow-ups are needed to fully answer this question; however, in this scenario the less invasive endodontic retreatment could be the first therapeutic option to be considered. Mozo-Grau/Ticare (Valladolid, Spain), the manufacturer of the implants used in this investigation, donated the implants and partially supported this trial; however, data belonged to the authors and the sponsor was not involved with the conduct of the trial or the publication of its results. Purpose: The objective of this 3-year post-loading parallel randomised controlled trial is to compare two bone substitutes and resorbable membranes in a one-stage procedure for horizontal bone augmentation: anorganic bovine bone and porcine collagen membranes (BB group) versus synthetic resorbable bone graft substitute made of pure β-tricalcium phosphate and porcine pericardium collagen membranes (CJ group). 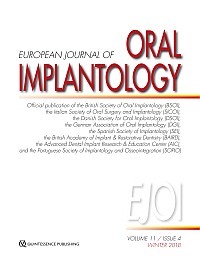 Materials and methods: Patients in need of implant treatment having at least one site with horizontal osseous defect at a private clinic in Rimini, Italy, were included in this study. Patients were randomised to receive either BB or CJ in a one-stage procedure for horizontal bone augmentation in a submerged approach. Randomisation was computer-generated with allocation concealment by opaque sequentially numbered sealed envelopes. Patients and the outcome assessor were blinded to group assignment. The abutment connection was made after 6 months of healing. The application of the provisional prosthesis was performed after abutment connection and a definitive metal-ceramic prosthesis was placed 6 months post-loading. The patients were followed-up to 3 years post-loading. Primary outcome measures were: implant failure, complications and peri-implant margin bone level changes. Secondary outcome measures were: visual analogue scale (VAS) for functional and aesthetic satisfaction and pink aesthetic score (PES). Results: Twenty-five patients with 32 implants were randomly allocated to the BB group and 25 patients with 29 implants to the CJ group. All 50 randomised patients received the treatment as allocated and there were 7 drop-outs in the BB group and 11 drop-outs in the CJ group up to 3 years' post-loading. There were no implant failures. There were six complications in five patients of the BB group and three complications in three patients of the CJ group (relative risk: 1.32, 95% CI from 0.37 to 4.64, P = 1.0000). Radiographic bone loss was 1.61 mm for the BB group and 1.02 mm for the CJ group (difference 0.54 mm, 95% CI from -0.53 to 1.60, P = 0.3100). The functional VAS was 9.0 for the BB group and 9.6 for the CJ group (difference 0.6, 95% CI from -0.4 to 1.5, P = 0.2393). The aesthetic VAS was 9.4 for the BB group and 9.6 for the CJ group (difference 0.2, 95% CI from -0.5 to 0.8, P = 0.6141). PES was 8.7 for the BB group and 8.5 for the CJ group (difference -0.1, 95% CI from -2.9 to 2.7, P = 0.9360). Conclusions: No significant differences were observed in this randomised controlled trial comparing anorganic bovine bone with porcine collagen membranes versus synthetic resorbable bone made of pure β-tricalcium phosphate with pericardium collagen membranes for horizontal augmentation. Thommen Medical AG provided the implants as well as the Jason membrane and Ceros TCP free of charge. Purpose: To evaluate the effect of sub-mucosal mechanical instrumentation following supra-mucosal plaque removal in the treatment of peri-implant mucositis. Materials and methods: A total of 44 patients, 27 from a specialist clinic in Sweden, and 17 from a Japanese one, were included. The 44 patients had a total of 175 implants of which 84 (48%) had clinical signs of mucositis (bleeding on probing [BoP]) and no radiographic bone loss. At baseline, the 44 patients received professional supra-mucosal plaque removal and oral hygiene instruction and motivation. Following the 1-month examination, sub-mucosal instrumentation was initiated using ultrasonic and hand instruments. Patients were then examined at 4 and 7 months. Presence of plaque, marginal bleeding, BoP and probing pocket depth (PPD) changes were recorded at each examination in an unblinded manner. Results: One month following supra-mucosal plaque removal, the number of treated implants with BoP was reduced from 84 to 44 (48% reduction) with a concomitant decrease of the mean PPD of 0.6 mm (95% CI: −0.5 to −0.7), from 4.4 ± 1.0 mm (mean ± SD) to 3.8 ± 1.0 mm, P < 0.0001. Following sub-mucosal instrumentation, a further reduction of 9% (from 44% to 36%) of BoP was recorded, with a concomitant reduction of the mean PPD of 0.3 mm (95% CI: −0.1 to −0.4) at the 7-month examination. Conclusions: The improvement of the clinical condition (absence of marginal bleeding, BoP and PPD reduction at treated implants) following non-surgical treatment of mucositis appeared to be in great part because of supra-mucosal plaque removal, while the sub-mucosal instrumentation seemed to have only a minor additional effect. Deep implant position compared to neighbouring teeth/implant was associated with persisting mucositis following treatment. The presence of deep pockets following treatment was associated with BoP, screw-retained prostheses without abutment and sub-mucosal crown margins. The authors declare no conflict of interest. The study was self-supported by the Department of Periodontology, Södra Älvsborgs Hospital, Borås, Sweden, and by the Department of Prosthodontics, Gerodontology and Oral Rehabilitation, Graduate School of Dentistry, Osaka University, Osaka, Japan. Purpose: To present a rare clinical case of migration of a displaced implant fragment from the maxillary sinus to the stomach. Materials and methods: A 66-year-old man was referred from a local dental clinic to remove a displaced implant apical fragment in the left maxillary sinus. After 15 days from the displacement, no foreign body was seen in the maxillary sinus or in any other craniofacial cavity. Thoracic and abdominal radiographs were taken, and a 3 × 3 mm radiopaque object, which corresponded to the piece of implant fragment, was detected within the patient's stomach. Results: Follow-up radiographs were taken to monitor the progress after 1 week, and it was found that the radiopaque object had disappeared. Conclusions: A displaced dental implant fragment in the maxillary sinus can migrate and exit from the maxillary sinus within a few days. Since it presents a potential risk for swallowing or aspiration, displaced implants or other objects in the maxillary sinus should be removed immediately. Before removal, additional radiographs are recommended to confirm the current position of the implant. The authors state that there are no conflicts of interest in connection with this article.